Watersports Guru was birthed from my love of the ocean. My parents said I was body surfing before I could walk, and dolphin calling before I could talk. Being born and raised on the magnificent Gold Coast and Tweed, I grew up enjoying the golden beaches and its surf. After travelling and exploring the planet for a season I returned, having earned my gills as they say; drawn back home by my longing for our pristine oceans and glorious weather. 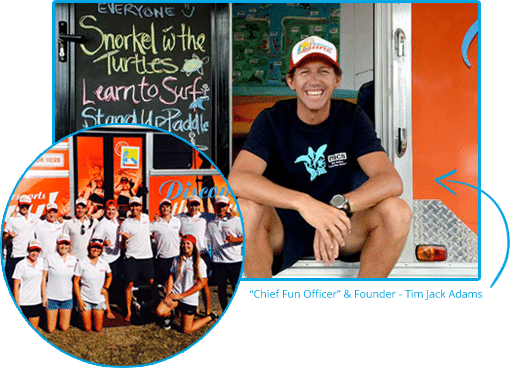 Watersports Guru began initially from a sports hobby, and through word of mouth has grown into an exciting and educational enterprise; that puts a big smile on many faces and supports local business. It also gives me an excuse to have fun all day! We’re involved with marine conservation and educating our youth through the marine museum at Hastings Point; which is a huge priority for me and personally rewarding. Seeing kids get off the couch and enjoying our natural surroundings is beneficial for them and the environment. With every one of our adventure travel and family tours you’ll have your own specialist instructor with you every step of the way. There is nothing that we cannot deliver on, and we love a challenge. Until then, take care of yourself, our planet, and enjoy yourself.